Any French person, whether they be Parisian or Provincial, will tell you that the best butter comes from Brittany. The combination of happy grass-fed cows and epically magnificent sea salt (Sel de Guérande) makes for some pretty righteous stuff. So righteous in fact that when I smuggled some home to California for Christmas one year and busted it out for my family to taste, they all closed their eyes and sighed as it melted on their tongues. Heaven, they said. This salted butter is Brittany’s culinary gem and it pops up in every famous Breton specialty. No galette would show it’s face on a plate without a heaping portion of beurre melting all over it. The display cases of every boulangerie are bursting full of butter, from the kouign amanns to the tart crusts to the cookies. But one cookie is particularly symbolic of Brittany and its butter: the sablé. Sable means sand in French. Not the most appetizing name for a cookie I suppose, but it makes sense as the cookie is crumbly and crunchy and grainy like sand. The best comparison for a sablé is shortbread, though they are lighter and less dense than their Scottish counterparts. Sift together the flour, cocoa and baking soda together into a bowl and set aside. Scrape dough onto a piece of plastic wrap, wrap it up and chill it in the frige until just firm, about 30 to 45 minutes. Heat oven to 350 degrees. On a floured surface, roll dough gently to desired thickness (they will puff ever so slightly in the oven). I did half of mine very thin (1/8″) for a crispier cookie and the other half a bit thicker (approximately 1/4″) for a more toothsome cookie. They’re delicious both ways! Once the dough is rolled out to desired thickness, cut into creative shapes with cookies cutters and space them an inch apart on a parchment-lined baking sheet. Sprinkle decoratively with coarse sugar. Bake for 8 to 10 minutes (for thinner cookies) or 10 to 12 minutes (for thicker ones). Leave cookies on baking sheets out of the oven for a couple minutes before gently, carefully transferring them to cooling racks, as they’ll be fragile until they cool. Cookies can be stored in an airtight container for up to two weeks of 4 p.m. rations. I’ve been wondering where the girl and her galettes had gone! We didn’t have these while we were there, something to look forward to. I especially love the closing comment: “two weeks of 4 pm rations.” A little something for tea time! I borrowed those words from Smitten Kitchen! 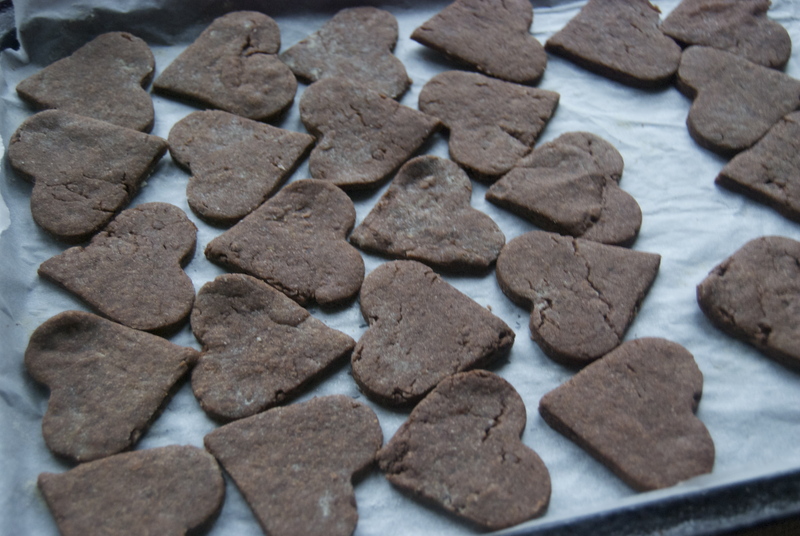 These look amazing, totally would of used this as v-day cut out cookie. I agree with scoopy, have been waiting for the next post! !